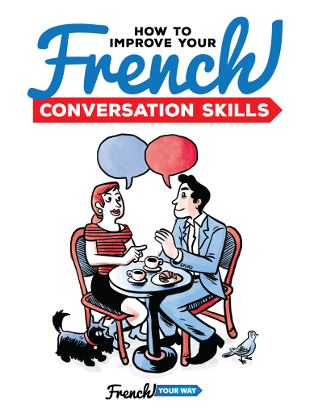 Challenge: Can I Make You Love French Grammar? I am begging you for a chance to explain why you should love French grammar… Please read on!! Many new students do actually start lessons with me by saying: “I want to learn French but I don’t want to learn grammar”. I find this most interesting as it raises many questions; not just about the teaching/learning method, but above all about the reasons why so many students refuse to have anything to do with grammar. For one, it is definitely something that most students are scared of – it may bring back bad school memories, I don’t know. It’s true that the word “Graa-marrr” does sound like the mumbling-roaring of some scary monster! “The study of how words and their component parts combine to form sentences. …You’ll notice that these definitions of grammar describe just what Jillian wants to be able to do! Jillian may not be aware of it but she will have to rely on the use of grammar, to create sentences. Only, she would like to learn how to create the sentences through implicit learning of French grammar. However it will still be a limited and slow process, especially if you are not regularly exposed to the language, for instance living in immersion in the foreign country. The child’s language development spreads over years of passive listening and readjustments! The major advantage we have when learning a foreign language formally, as adults, is that we can save an incredible amount of time by having the rules explained to us instead of having to discover them ourselves. It’s like breaking up the system in the smallest elements possible to understand how they work. Getting to know how a language works is the best way to help you generate any sentence in that language, with consistently good results. Think about a car. If your car has a problem and you don’t understand how the different spare parts work together then you can’t fix it yourself. You can’t really go far if you don’t understand what you’re doing. Think about a house: you can’t build a house on weak foundations. 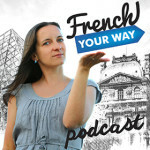 Understanding French grammar is the fastest way to learn French with strong foundations to build on. Grammar can be simple. When you ask if the word “maison” (“house”) is masculine or feminine in French, you are already doing French grammar. (By the way, it is feminine). It is useful, because if you want to describe this house in more detail, eg. it’s big / white / pretty, your knowledge of grammar will tell you that all these words (they’re adjectives) will need to match the word “house” too (these adjectives will be in the feminine form). When you look up a word in the dictionary, you first need to know what type of word you are after (a noun ? A verb ? etc), so having some basic knowledge of grammar is essential. Also check out my article “How to Use your Dictionary Efficiently” (includes a free practice worksheet!). Not knowing how to say “fly”, she had looked up in her dictionary. a verb : to fly – in the sky, generally with wings. Planes fly. Birds fly. “Je voudrais devenir pilote pour voler autour du monde”, not « Je voudrais devenir pilote pour la mouche autour du monde » ! More about using your dictionary efficiently. I have created a proofreading checklist for your French essay writing. In addition to empowering you with proofreading skills, if you know the name of the grammar notion that you want to study, you can easily find exercises and resources about it online or in grammar books. Besides, an explicit knowledge of grammar will allow you to be on the same page as your teacher. You will know what things are called – in other words, you can “appeler un chat un chat” (“call a spade a spade”)- and that makes it easier for reference. My students and I can understand each other very easily and quickly. If a student says something and omits a word (an article for instance), I can just point out: ”Where’s your article?”, and they will immediately know what I mean and correct themselves. (mind you, they knew nothing about grammar when they started either, but the “Introduction to French Grammar” document that I designed for them helped them tremendously). For a number of years now, grammar learning has been dropped from Australian school programs. As a result, most of my students of French have no explicit notion of grammar, even in their native language. I think that the Aussie school system hasn’t done them a favour in that regard, because grammar is a powerful tool, especially if you want to study a foreign language. But that’s not all: starting to reflect on French language had an unsuspected but extremely positive side effect for my student Bernadette. She started to develop awareness/a good understanding of how English language worked as well, and became very interested in that too. Also, I believe that building bridges between languages and cultures is a sure way of getting a deeper understanding of both. That’s why I constantly encourage my students to reflect on how both French and English work. A language is a system of communication used by a particular country or community. The people from different cultures and countries see the world differently, they think differently and as such their languages are different. A language is the reflection of these thinking patterns, or sometimes the needs that a given group of people have to use certain words. Inuit people have a wide range of words and roots to describe the “snow” (snow on the ground, from the air, snow as construction material for igloo, slush, etc), because the differences are relevant and important for daily use and for survival. Chinese is the only remaining language in the world to use characters that can express words and ideas in themselves. Studying their origin (as I did, especially while I was living in China) is a fascinating experience, a real journey into the Chinese culture (both Ancient and its adaptation to the modern world). A language reflects a particular approach to things/vision of the world, and therefore, studying languages opens windows onto the world (not only by means of actual travelling).It is enriching and rewarding. And it is the explicit learning of grammar that gives the keys to access this knowledge and reflection. Emotions and sense of security are important when you learn. If I had had a great History teacher as a child, I would have loved History sooner. Now I do, thanks to a great French history specialist (the equivalent of a good teacher! 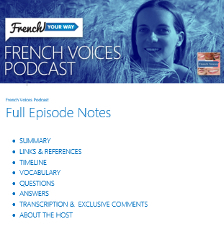 ), Franck Ferrand, whose shows I enjoy on podcast and the radio! Have I convinced you? 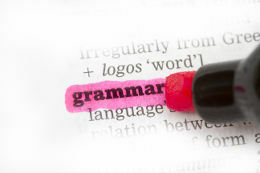 Will you give grammar a chance to be your best learning ally? 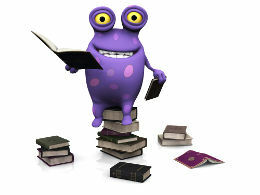 Please leave me a comment to let me know whether the scary monster has become a friendly one! Perfect to learn or brush up grammar notions. For each of these notions, the book explains how it works in the English grammar and then in the French grammar. Allowing you to create such bridges should make learning way easier. Clear explanations about English grammar (not French grammar), packed with humour and quotes that should make even the most reluctant student crack a smile. Give it a try and let me know how you’re doing! Please share this article if you’ve enjoyed it, your support means a lot!